Looking for a tasty vegetarian meal that won’t break the bank? Every single day in the undying fires of Hell, astronaut Neil Armstrong and Founding Father Thomas Jefferson get together and whip up these easy, delicious vegetarian meals together while the flames torment them forever. They are best friends and they are in Hell. Enjoy! 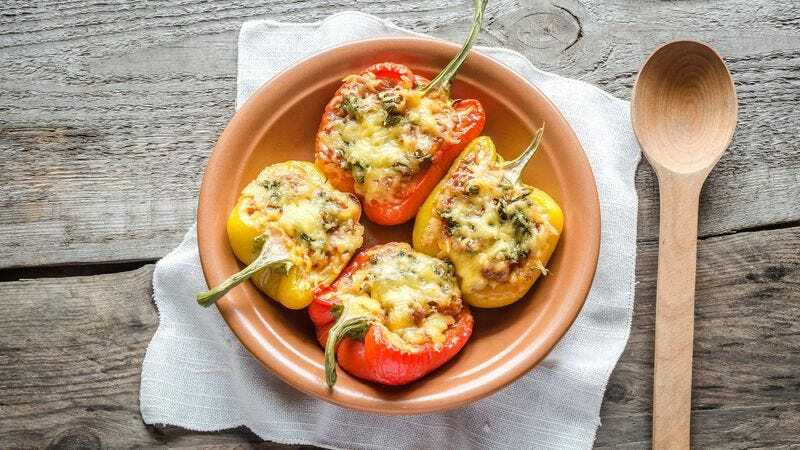 When it comes to a hearty vegetarian meal that will fill you up while packing in the vitamins and protein, nothing beats roasted red peppers stuffed with breadcrumbs and goat cheese. Neil Armstrong and Thomas Jefferson know this better than anyone, because they cook this dish together in Hell. Every single day in the sulphur-caked underworld, Neil Armstrong and Thomas Jefferson stagger over the jagged cliffs of brimstone, flames scorching their flesh, as they forage for the five easy ingredients used in this tasty low-calorie offering. Neil Armstrong lets out a single shriek of agony and then turns to Thomas Jefferson and says, “Come on now, my terrific pal. It’s time to make roasted red peppers stuffed with breadcrumbs and goat cheese.” Thomas Jefferson nods and screams. He nods because he knows it is time to make roasted red peppers with breadcrumbs and goat cheese. He screams because he is in Hell. It doesn’t get any simpler—or more delicious—than this! All this hearty vegetarian dish requires is cornmeal, okra, and an egg. Neil Armstrong likes to scream with agony while Thomas Jefferson coats the okra in a thin layer of cornmeal in Hell. The whole thing is ready in just 30 minutes, at which point Thomas Jefferson coughs up a cloud of maggots, which then devour his skin. Neil Armstrong is forced to spoon-feed the fried okra to Thomas Jefferson while the maggots burrow through the Founding Father’s innards. It’s horrifying for Neil Armstrong to watch this, but he can’t close his eyes because in Hell, Neil Armstrong has no eyelids. Add a few squirts of sriracha for an extra kick! If you’re looking for a little meat-free Southwestern flare, nothing does the trick quite like three-bean chili! It’s spicy and flavorful, and the best part is you can make it in 15 minutes after a long day at work! In the depths of their eternal misery, Thomas Jefferson frequently turns to Neil Armstrong and says, “My sweet moon-man, we have to make three-bean chili.” Neil Armstrong nods and screams as a demon drives a rod of white-hot steel into his eye. “The only thing I hate more than being in Hell was walking on the moon,” Neil Armstrong gasps between his howls of agony. Satan, the Lord Of Darkness, brings the two best friends Tupperware filled with fava beans, black beans, and kidney beans. Together Neil Armstrong and Thomas Jefferson whip up this hearty, easy-to-make delight while they are whipped mercilessly by Dagon, the demonic fish-god of the heathen Philistines. Sweet? Check. Tangy? Check. Perfect summer side dish? Absolutely. This pumpkin soup is sure to please full-time vegetarians, but even meat-lovers will fall in love with its deliciousness. Unfortunately, in Hell, Neil Armstrong is entombed forever inside of his space suit, so he never gets to taste this sweet-and-tangy vegetarian treat, which he makes every day in Hell with Thomas Jefferson, who wrote the Declaration Of Independence. While these two best friends mix onions into the pumpkin puree, Satan, the Lord Of Darkness, whispers into Thomas Jefferson’s ear and warps his mind so that he believes that he was the one who walked on the moon. “I walked on the moon,” Thomas Jefferson says to Neil Armstrong. “You have not spoken truth!” screams Neil Armstrong, “I was the one who walked on the moon!” “No, I am of moon!” screams Thomas Jefferson, as he tugs at his own long gray hair and licks his lips like a maniac. Thomas Jefferson bites Neil Armstrong on the thigh and Neil Armstrong’s screams echo throughout Hell. The two friends begin to fight and they drown each other in the pot of delicious pumpkin soup, which you can make in just 20 minutes for less than $10. The next day, they wake up in Hell. They will always wake up in Hell. When it comes to making convenient, meat-free meals, you could do a lot worse than Neil Armstrong’s hair with Problem Sauce. Every morning, Neil Armstrong wakes up in the bed of maggots that he shares with Thomas Jefferson and he discovers that Satan, the Lord Of Darkness, has left of bowl of the astronaut’s very own hair on the floor. Neil Armstrong and Thomas Jefferson dutifully dump the bowl of Neil Armstrong’s hair into a saucepan and simmer it for 15 easy minutes as flies eat their eyes and their blood rises to an excruciating boil in the heat of the flames. Then they add the Problem Sauce, which is a special brown sauce from Hell that tastes like madness and smells like hopelessness. Thomas Jefferson is allergic to Neil Armstrong’s hair, so when he eats it his neck bulges out in a round orb like a bullfrog’s. The whole dish costs under $10! You who are among the living may delight in the spicy flavors of Szechuan-style eggplant stir-fry. But for Neil Armstrong and Thomas Jefferson, this affordable vegetarian feast, ready in just 25 minutes, offers no relief from the endless torment of damnation. For Neil Armstrong and Thomas Jefferson, the only comfort is friendship. There is solace in the knowledge that every night Neil Armstrong and Thomas Jefferson will go to sleep in the same sauna-hot doghouse in Hell, and awake each day to face the undying agony of perdition. They will cook Szechuan-style eggplant stir-fry over and over again for eternity, but at least they will do it together.